Stop wasting time searching through your project hierarchy, using advanced scene search! Advanced Scene Search lets you search through all the objects in your current scene, using wildcards for the name, searching for specific components, tags, layers, etc! Use wildcards, or even Regex! 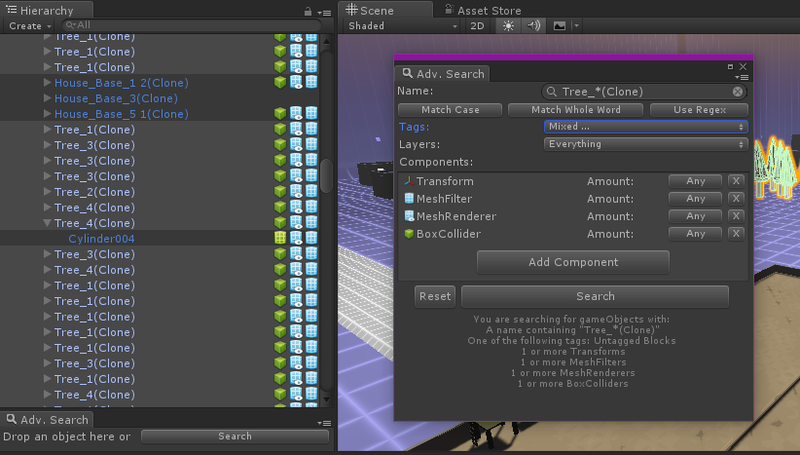 Drag on an existing gameobject to add all it’s components, tags, etc to the search settings! Want to find any objects similar to a certain object in your scene? Drag said object straight onto the window, or onto the compact drop target window (to save valuable editor space!) and the search window will be autofilled with the components etc from that object! Want to find all your gameobjects with a certain component on, or a certain combination of components, so you can multi edit them? This lets you do that almost instantly! Simply click the ‘Add Component’ button and select the components you want from a convenient dropdown! You can set the exact amount of that component you want to find too! Want to search for objects with similar names? It supports searching by name with wildcards in, or using full regex queries! Coming to the asset store soon!